An innovative wood-based sponge able to absorb oil from water could offer a new way to clean up oil spills. The wooden sponge was created by a team from the Chinese Academy of Forestry, who first removed the lignin and hemicellulose from the cell walls of balsa wood to create a very porous structure. 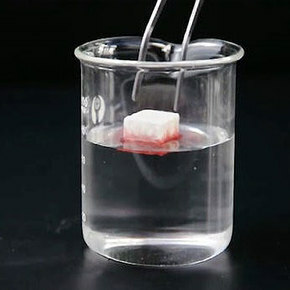 They then freeze-dried the material and used a silylation process to grow a water-repelling polymer inside the pores, resulting in a sturdy sponge able to absorb up to 41 times its own weight in oil. The sponge can be reused at least ten times before being discarded; and unlike its counterparts, will safely biodegrade.